Movie Treasures By Brenda: Does Santa Claus Have A Daughter Named Annie? Does Santa Claus really have a daughter? This post was inspired by a friend who pointed out something so obvious that I well, totally missed it. 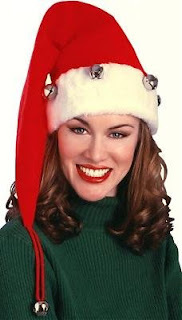 Yesterday, I wrote about the new lineup of Hallmark Christmas movies for 2011, one of which is Annie Claus' Year off. It tells the story of Santa's daughter, Annie, who takes the year off to live in the real world and decide whether or not she really wants to take over the family business when Santa Claus retires for good. She sets off for Los Angeles in search of real life and, well, LOVE. (It is a Hallmark movie.) She is unaware that an actor has been hired to win her affections and she falls for the imposter but eventually discovers that a toy store owner who needs her help is a better match. STOP -- This is when my friend Susan52 pointed out the obvious -- she is intrigued by this film because previously she had been unaware that Santa Claus had a daughter. And she is right, who knew? Order this Santa Claus hat from Amazon for your adult daughter.